WHO LIVES IN AN APARTMENT LIKE THIS? I din’t know if they got this programme in other countries, where the presenter Lloyd Grossman, would film a celebrity home pointing out all the little clues that were there to the personality of the resident. Then a panel of celebrities would have to guess who lived there. Lloyds catchphrase was “who lives in a house like this? As we all like to nosey in other peoples houses, this voyeuristic quiz show was a success for quite a while. So the other evening Lizzie and I were sat in our rented Paris apartment, looking at all the details and speculating on who the owner is, what kind of person. The name on the door is Elissavet —— so we know she is a female. 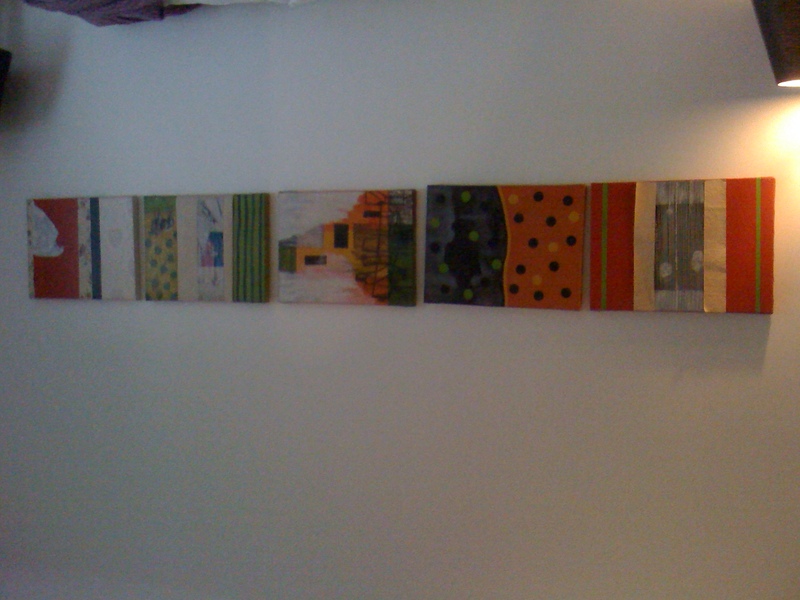 It is a light and airy apartment in a very eclectic style. 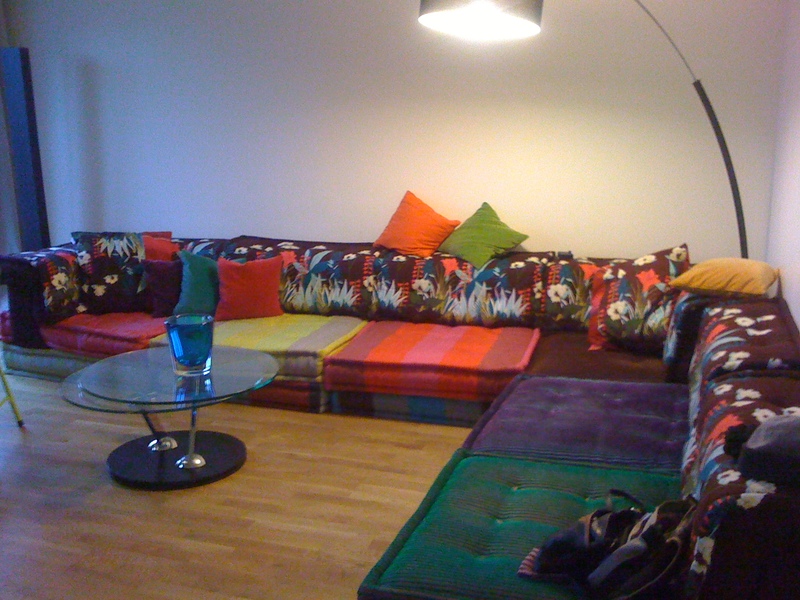 so we think the owner is not conventional The living room is dominated by this funky modular sofa. Lots of seating to entertain people, so we decided she must like socialising and be very friendly Visions of warm parties where people sit around talking and drinking wine. But the sofa is very low, so we decided that it must be a young woman, who is maybe a little unconventional. We are assuming this is home made. Elissavet either painted it her self or was given it by a ? boyfreind. 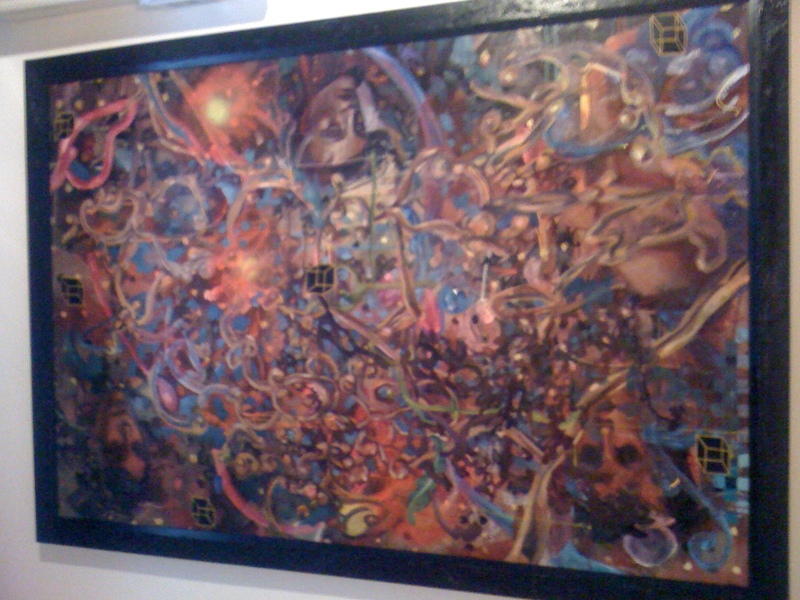 Still, the painting is a sign of a very complicated mind. Maybe troubled at times? I saw it as the gateway to hell, Lizzie thought it was bright and joyful, but the more we looked at it it seemed like it was the vision of somebody on a drug trip! Have no idea what this is about. This is much more craft based, made from scraps of fabric and shows a much more neat and organised mind than the painting in the living room. 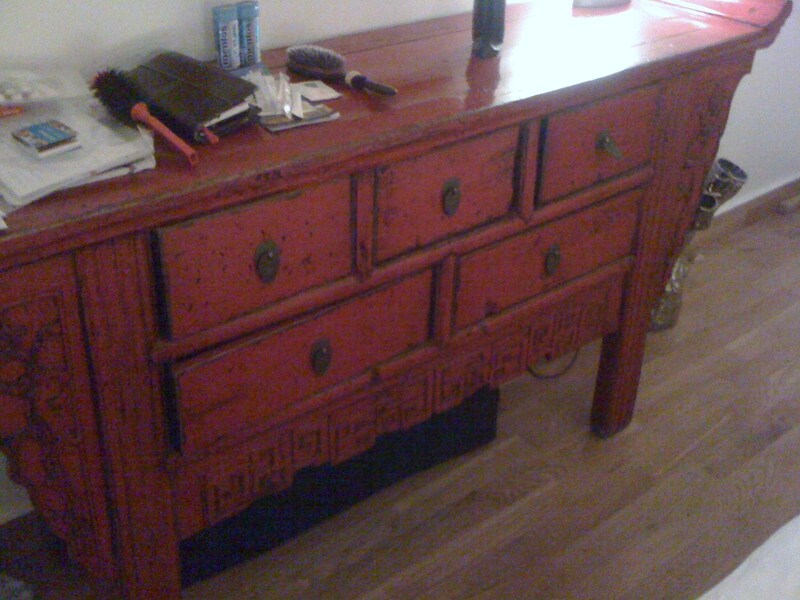 The apartment is very modern, but then she has this lovely sort of oriental chest. Maybe there is some Oriental in her background….Japanese? Chinese? ..and then this Very conflicting styles. 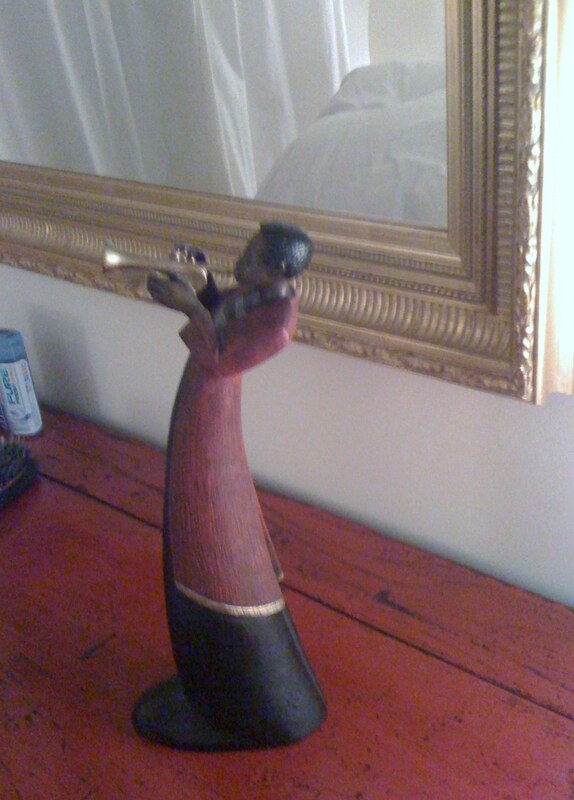 sort of African woman playing an instrument. and the very ornate mirror frame behind. 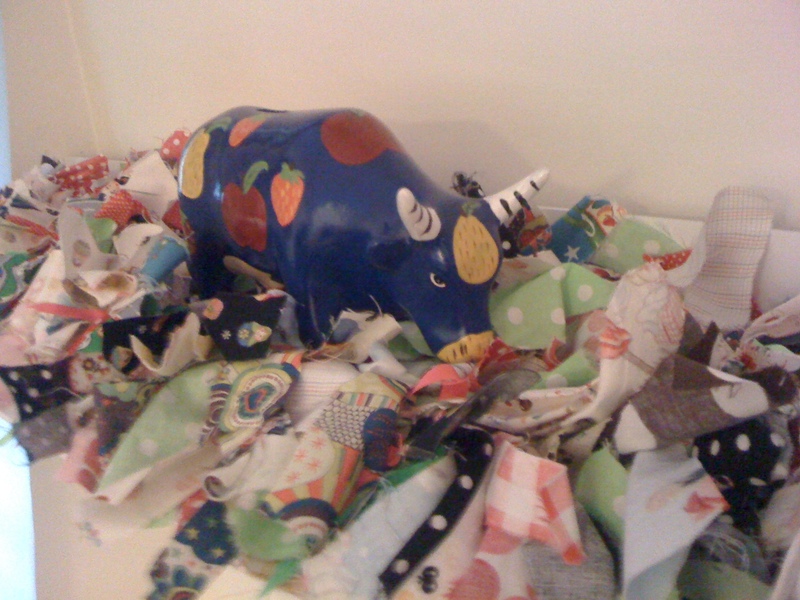 There is a charging bull with patchwork rag “grass” so maybe some Spanish influence? 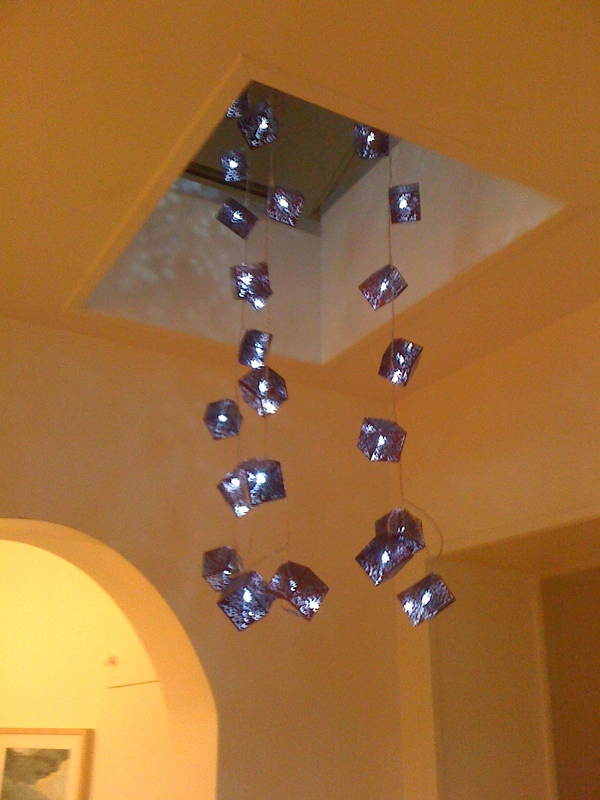 Then this really modern funky light hanging down from the loft entry. 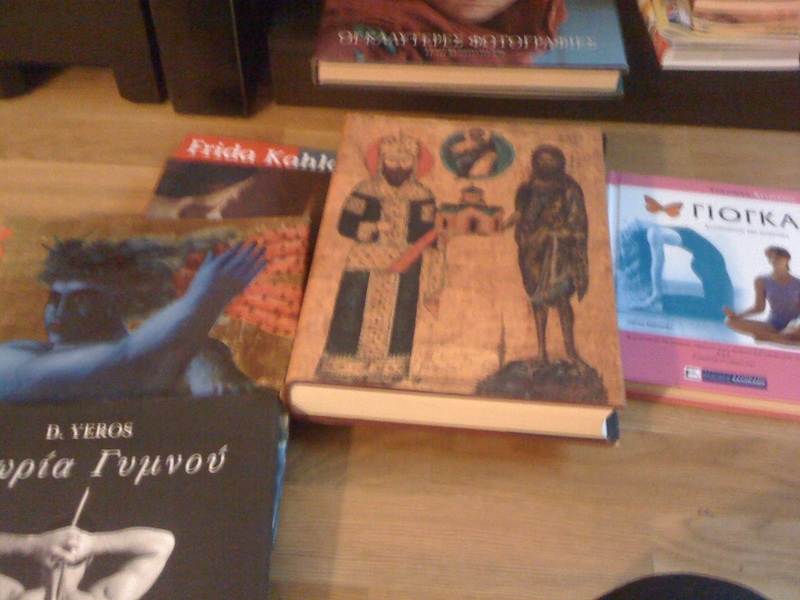 Then we looked at the books, and realised She is probably Greek!!! BTW here is the link to the apartment advert. Tags: Paris apartments, Voltaire apartment.. Bookmark the permalink. Hi Nancy…location for me is great, but then I don’t really care to stay in tourist places. If I lived in Paris this is where I would live. 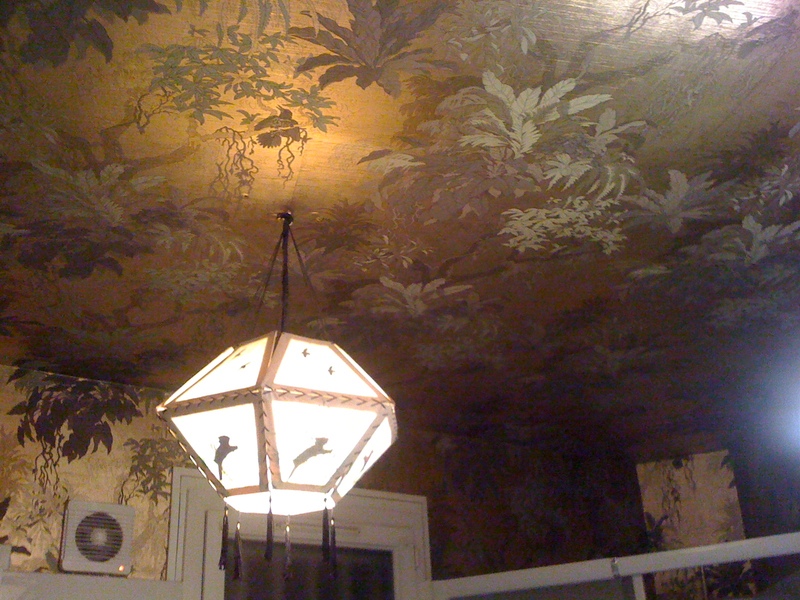 The apartment is on Boulevard Voltaire, in the 11th arrondissement. right near the Oberkampf metro station with access to lines 5 & 9. The Republique metro “hub” is less than five minutes walk away with several lines there , The 96 bus stops round the corner which takes you from Bellville , through the Marias, past Hotel de Ville over to the left bank St Germain des Pres. and on to Montparnasse and the 56 bus just outside the door takes you to Gare du Nord or east towards Vincennes. so transport links are good. You can walk in five minutes.a across Boulevard Beamarchais to the north of the Marais and of course for me there are three velib stations within two minutes and the canal st Martin area not far away. The while area abounds with cafes, shops, bars ,Parmientier market Tuesdays and Fridays, circus. and the trendy Oberkampf/ Jean Pierre Timbauld area is a block away. Forgot to answer your second question…..this is the first time for a long time I do not have another trip to Paris booked, before I leave Paris. I am going to California end of April and May, alone and leaving Michael for nearly a month. I am sad that I will be leaving him for so long, nearly a month.and it worries me. But it was booked last year, before his recent illness….. and what will be will be. Just for today he is well. Having said that I am GAGGING to go back to Paris, alone (or with Michael, because we can be separate while we are there). but I think he would rather go somewhere else. “some winter sun” he says. So my travel plans are rather uncertain at the moment. This place looks familiar!!!! I too enjoyed staying here but did think the decor was a bit mixed and different – didn’t spend as much time thinking about it as you and LIzzie did but now it’s interesting for me to read your thoughts! Hi Sandy. Lizzie and I were both ill during this trip, so we had time to ponder these things. Whoever she is I am glad she has this apartment in Paris so we can visit. I also stayed here with Michael in the summer and it feels like home. No Sandy it wasn’t flu, only lasted a couple of days, so we were still able to enjoy Paris. 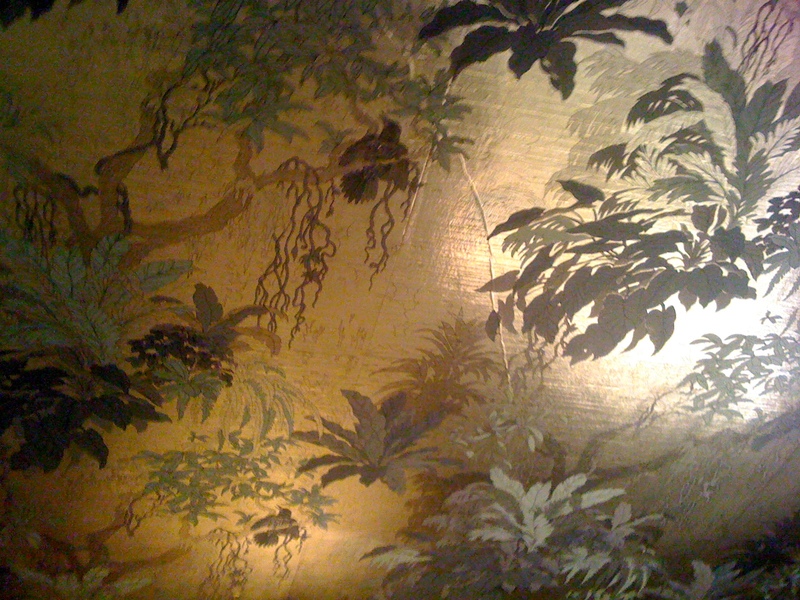 We went to the same jazz club d’Atelier du Charonne, One thing I like about it is that they keep social hours.